 Sherlock Holmes's smarter brother Mycroft was reputed to be so indolent that only cases of national security could rouse him to a real effort. 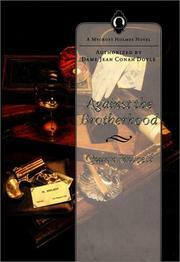 So it makes sense that Fawcett's new series of pastiches, authorized by Dame Jean Conan Doyle, would begin by pitting him against the Brotherhood, a shadowy organization of fin-de-siäcle terrorists bent--a frightened anonymous letter and some coded German messages suggest--on intercepting and assassinating Cameron MacMillian, trusted courier for a treaty on whose success the European peace hinges. Mired at home in Admiralty intrigue, Holmes sends Paterson Erskine Guthrie, his secretary and amanuensis, into the enemy's lair, grooming him to pose as a luckless heir who can be bent to the Brotherhood's vilest purposes. The ruse is successful in getting the Brotherhood to take Guthrie on--insinuating him as MacMillian's secretary so that he can deliver the treaty to them--but it does keep Holmes, the alleged star, offstage for an intolerable stretch. And by the time he does make his reappearance (to be joined eventually by another ally whose incognito will fool only readers as new to this sort of thing as Guthrie) in MacMillian's bedeviled train trip across Europe, the conspiratorial intrigue has settled for keeps into a potboiling groove. Colorless, endlessly surprised Guthrie, though no Watson, is Fawcett's most successful creation. The desperate villains are MGM stock, and Mycroft gives no evidence of either the presence or the brains that would justify the new life the series promises.